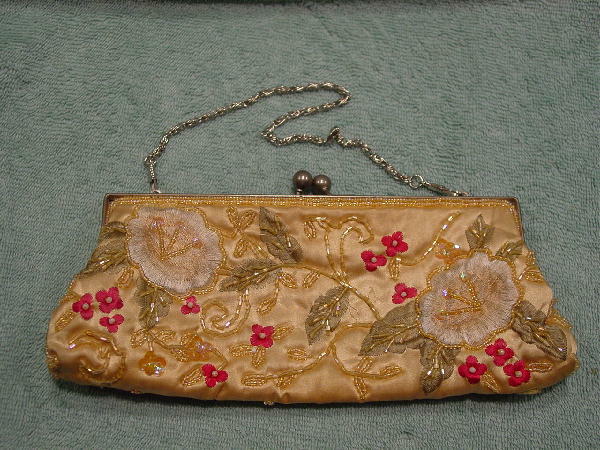 This vintage champagne silk-blend fabric purse has a thread, sequin, and bead floral design in offwhite, red, green, and iridescent peach-cream. There is a somewhat tarnished silver-tone bypass closure and an interior pearlized yellow-peach synthetic lining with an open pocket. 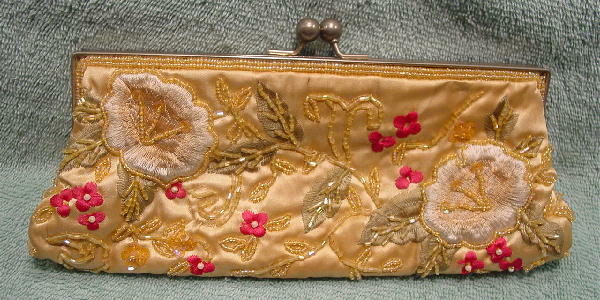 It has an interesting silver-tone link chain, which you can tuck inside or detach it and carry the purse as a clutch. One side has a few beads missing. There are two rows of beads below both sides of the rim. She wore it once, to a movie premiere.